Valentine’s Day is just days away and I foresee many many chocolates, flowers, and cutesy cards floating around homes and offices nationwide. I’ll admit that it’s a bit of a contrived holiday, and I have many friends who oppose the “so-called” romantic day, but I still find it endearing in many ways. And if it gives us a chance to spend some time with people we love, then who am I to get in they way? Join them, I say! :) So, for the occasion I’ve put together a casual-yet-holiday-worthy Valentine’s Day outfit and offer a few quick and easy outfit suggestions as well… Read on for more! To instantly elevate any outfit, choose a well fitted and tapered jacket. Take a look at two of my favorite tapered jackets in white and light pink colors. Cardigans are a more casual alternative that also offer quick coverage and warmth. 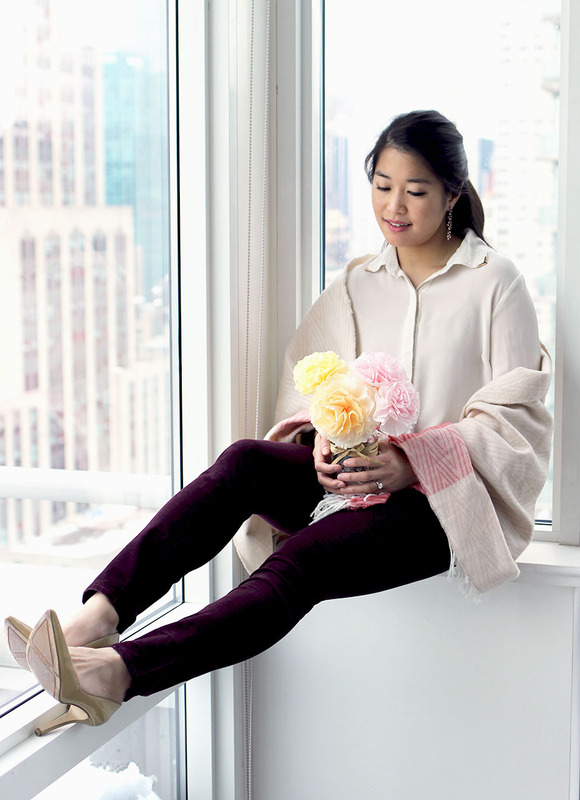 Drapey cardigans can additionally add a fun element of movement to an outfit. For example take a look at this merino wool cardi. In this outfit, while admittedly neither a jacket nor cardigan, I draped a patterned fringe scarf to add an extra bit of layering to an otherwise simple collared blouse. Last but not least, attention needs to be given to shoes. In the words of Marilyn Monroe: Give a girl the right shoes, and she can conquer the world. Wise words. Wearing a pair of shoes that make you feel good and make you look good, will give you the confidence to own them and in effect, own YOU! I’m all about finding shoes that are both gorgeous to look at and comfortable to wear. Play around with your shoe choice and see what makes your outfit and your confidence stand out! For me, I’m a big fan of Nine West and their various heeled offerings. These patent leather pumps have been in my rotation of years (literally). They look amazing and I can wear them all day without complaint! Thanks for stopping by–I sincerely wish everyone a wonderful start to the week and an early Happy Valentine’s Day! Whether you’ll be celebrating or not, I send my <3 to you. As always, I would love to hear from you, so leave YOUR thoughts in the comments below! Hope to see you again soon with more outfits and recipes. pants | loft, now on sale $13!